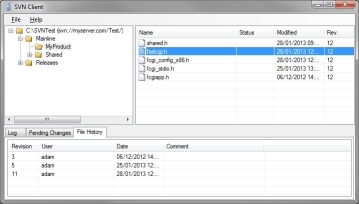 SVNBreeze is a Windows GUI client for accessing SVN repositories and working copies. What is unique about SVNBreeze is that it is aimed more at Windows developers than Linux. One option available is to change the "phrases" used in the application to match what Windows developers are more used to seeing, e.g. TFS. Another very big difference is the ease at which to branch and merge folders and files. Select either SVN or TFS "phrases"
SVNBreeze is now available for free for personal use or if you operate your own business where you are the sole employee/developer. Please contact Sales regarding this free offer. A 30 day trial is available but you will need to request a trial license key from Sales. You can download the trial from the downloads link on the left but you will need a trial license key for it to work.